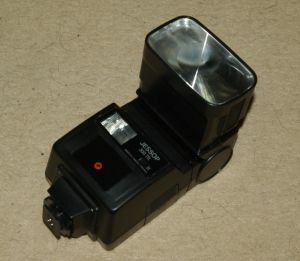 1990's thyristor flash unit with tilt and swivel head, with slide switch for Pentax, Nikon or Minolta compatibility. Has two Auto modes and a third which is either TTL or manual depending if the camera has TTL capability or not. Has "Ready" light, Test button, and "OK" light. Head zooms between wide angle and telephoto. Secondary catch-light flash can be turned off. This is an independent and cheaper equivalent to the Pentax AF280T, and I bought it c2000 as a replacement when my 280T broke down. (I subsequently mended the 280T, but two units are handy). I have measured the trigger voltage as 5.9V, correct polarity (the AF280T was 7.8V). It takes 20-25 seconds to charge from dead with NiMH rechargeables, (same as my AF280T). The head pulls in and out for wide, normal and two telephoto positions. There are two auto modes (for F4 and F8 at 100 ISO) and the TTL mode. At first sight there seems to be no manual mode, but in fact the TTL mode is a manual mode if the camera does not provide a TTL signal, or the unit is off-camera without the auxiliary connections being made. There are no reduced power manual modes. Construction is what you expect for a budget unit, but in the battery door department, which seems to be a weak point with many flash units, it is fine : the door slides in a groove, the downside of which is that it could be dropped and lost while changing batteries. All times are GMT -7. The time now is 11:06 PM. | See also: NikonForums.com, CanonForums.com part of our network of photo forums!